FWS wetland designed for comparable effluent goals; however, it is not always obvious which concept will be the more cost effective for a particular situation. The final decision will depend on the availability and cost of suitable land and on the cost required for acquisition, transport, and placement of the gravel media used in the SSF bed. It is likely that economics will favor the FWS concept for very large systems as these are typically located at relatively remote sites and some of the advantages of the SSF concept do not represent a significant benefit. The cost trade-off could occur at design flows less than 0.1 mgd (378 m3/d) and should certainly favor the FWS concept at design flows over 1 mgd (3785 m3/d). In some cases, however, the advantages of the SSF concept outweigh the cost factors. A SSF wetland system has been designed, by the senior author of this book, to treat a portion of the wastewater at Halifax, Nova Scotia, and the thermal advantage of the SSF wetland type justified its selection for that location. 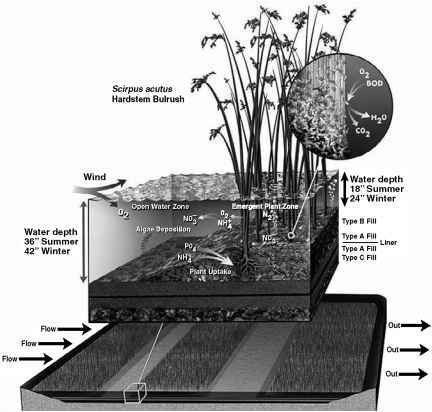 Where nitrogen removal to low levels is a project requirement, the use of Phragmites or Scirpus in a SSF system is recommended. These species or Typha should all be suitable on FWS systems, but Phragmites will be less susceptible to damage from animals (see Section 6.2). 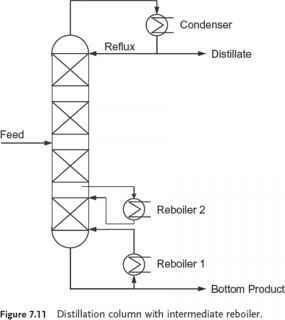 The use of the nitrifying filter bed (NFB), as described in Section 7.9, should be considered as an alternative when stringent ammonia limits prevail. movement of the duckweed cover by the wind; a semipermanent layer of duckweed on the water will prevent any oxygen transfer. The open-water zones, as shown in Figure 6.4 at Cle Elum, Washington, also minimize short-circuiting. If the deep-water zones represent more than 30% of the total system area, the system should be designed as a series of wetlands and ponds using the procedures in this chapter and in Chapter 4. The use of submerged plant species (see Section 6.2) in the deep-water zones will enhance habitat values and may improve water quality. In such cases, the water depth in the zone must be compatible with the sunlight transmission requirements for the plant selected, and the development of a duckweed mat must be avoided. FIGURE 6.4 Free water surface (FWS) wetland at Cle Elum showing bulrush and open water. number of FWS systems designed for northwestern Canada faced the risk of severe winter freezing and therefore have been designed for winter wastewater storage in a lagoon and wetland application during the warm months. Incorporation of habitat and recreational values is more feasible for the FWS wetland concept because the water surface is exposed and will attract birds and other wildlife. The use of deep-water zones with nesting islands will significantly enhance the habitat values of a system, as will the supplemental planting of desirable food source vegetation such as sago pond weed (see Section 6.2).